For me, a pot roast dinner is certainly not the first meal that comes to mind when I think “company-worthy.” Until my later adult years, I’ve always considered it a “meh” meal. 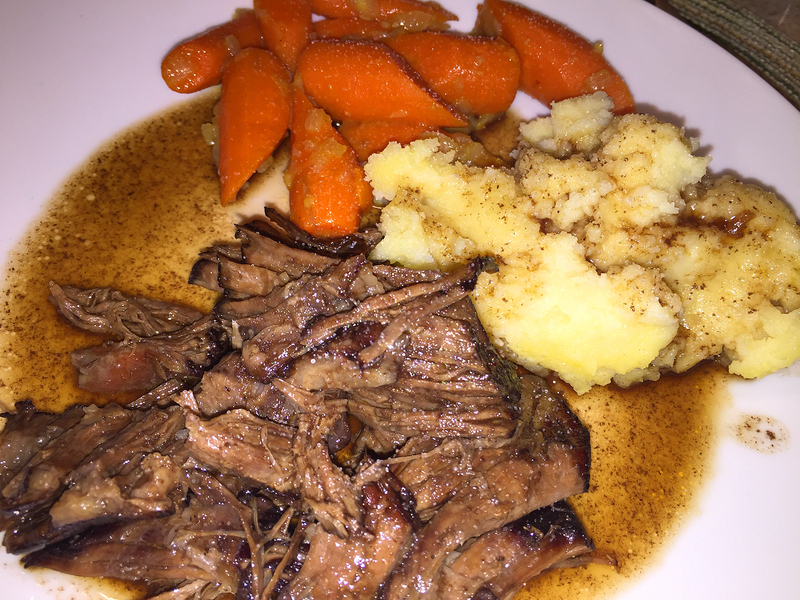 But this Zinfandel Pot Roast with Glazed Carrots & Fresh Sage recipe from cookbook author Molly Stevens altered my “meh” mindset. She thinks of it as dinner-party pot roast, and after making it, so do I—although for our first go-around, it was just for me and hubby, with leftovers of course. It may seem a bit unwieldy at first glance when you take note of the long list of ingredients and the number of steps in the directions. Don’t shy away though, it’s great for a slow, lazy weekend afternoon. Plan on about 4+ hours from start to finish. After the initial prep of browning the meat and making the braising liquid, the roast will cook unattended for three hours (with just one flip midway) and fill your home with tantalizing aromas—prepare your self. According to Molly, while the basic technique is the same as a regular Sunday night pot roast, the herb-flecked carrot garnish makes it dressy enough for company. Instead of braising along with the beef, the carrots are glazed on top of the stove in a bit of the Zinfandel braising liquid just before serving, so that they remain bright and crisp—a fresh contrast to the gorgeously tender beef. At Molly’s suggestion, we used a combination of parsnips and carrots, which both cook in the same amount of time. Your first choice for this recipe should be top blade roast because its neat shape makes it easy and elegant to carve for guests. You can certainly select other pot roast cuts, which we had to because no top blade was available. In fact, we bought two smaller chuck roasts as that was our only option. Molly’s recipe only calls for two garlic cloves, but “go big or go home” I say, so I tossed in four large. And you know I’m always touting the use of homemade stock instead of store-bought, but with no homemade beef in-house, I incorporated the Better Than Bouillon brand. Next time, we’re seriously toying with the idea of increasing the amount of wine and stock by 50% (1 1/2 cups each) resulting in more of the cherished liquid—it was truly oralgasmic! Tying the meat: Using a kitchen string, tie the beef into a neat, snug shape. 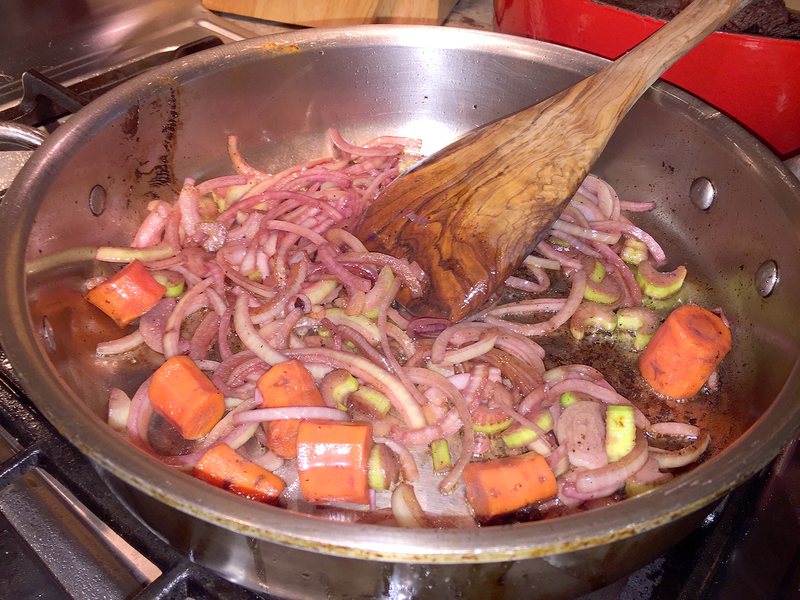 The aromatics and braising liquid: Return the pot to medium-high heat and add the onion, carrot, celery and garlic. Season lightly with salt and pepper. Cook, stirring often, until just starting to brown, about 5 minutes. Pour in the wine, scrape the bottom with a wooden spoon to loosen any of the cherished cooked-on bits of caramelized beef juices, and boil to reduce the wine by about half, about 6 minutes. Add the stock, return to a boil, and boil to reduce by just about one third, another 5 minutes. Return the meat to the pot, and add the sage, parsley, and peppercorns. Cover with a piece of parchment paper, pressing down so that it nearly touches the meat and the edges of the paper overhang the pot by about an inch. Set the lid in place. The braise: transfer the pot to the low third of the oven and braise at a gentle simmer, turning the roast once halfway through braising, until fork-tender, about 3 hours. Peek under the lid after the first 10 to 15 minutes to check that the liquid isn’t simmering too vigorously; if it is, lower the oven heat by 10 or 15 degrees. The garnish: while the beef braises, cut the carrots into sticks by cutting them crosswise in half, then cutting the halves lengthwise into sticks about 3 inches by ½ inch. This typically means cutting the thicker tops into quarters and the skinnier tips in half. (If using parsnips, remove any woody core before cutting them into sticks) You can chop the sage and parsley for the garnish now as well. Set aside. The finish: remove the pot from the oven. Lift the beef out with tongs or a sturdy spatula, set on a carving platter to catch the juices, and cover loosely with foil to keep warm. Strain the cooking liquid, pressing down on the solids to extract as much liquid as possible. Discard the spent aromatics (there is a lot of flavor in this and Russ likes to eat the solids and/or add to his mashed potatoes), and pour the liquid into a medium saucepan. 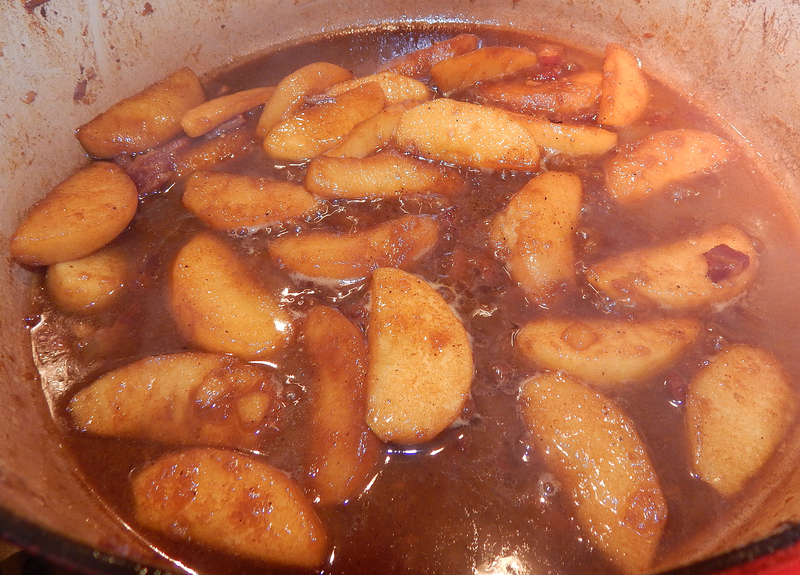 Let the braising liquid settle, then if possible, spoon off and discard as much fat as you easily can with a wide spoon. 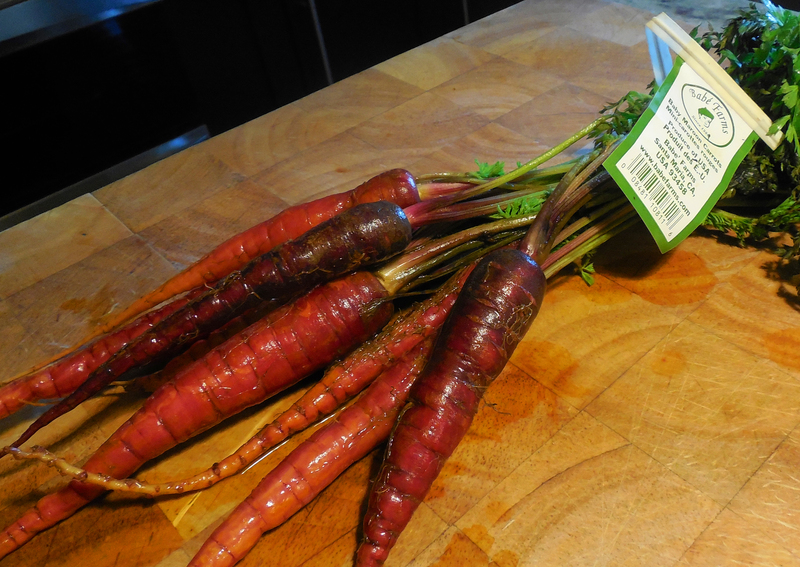 Measure out ½ cup of the juices for glazing the carrots and set the rest aside in a warm spot. Glazing the carrots: heat the oil and butter in a large skillet (12 or 13 inch) over medium-high heat. When quite hot, add the carrots (and parsnips, if using), season with salt and pepper, and cook briskly, shaking or stirring them, until lightly glazed and brown in spots, about 8 minutes. Add the ½ cup braising liquid, cover partway, reduce the heat to medium, and simmer until tender but not at all mushy, 6 to 8 minutes. Uncover, raise the heat, and bring back to a boil. Add the vinegar, sugar, sage and parsley and cook until the liquid is reduced to a glaze, about 1 minute. Taste for salt and pepper. We are enamored of the Basque Country in Spain and adore lamb, so when we realized we had a few pounds of lamb stew meat in the freezer, Russ immediately went about researching possible recipes. After reviewing oodles of them, we settled on this Basque Sheepherders Lamb Stew from our copy of The Complete Meat Cookbook by Bruce Aidells and Denis Kelly. To round out the meal we added rosemary roasted baby potatoes and a green salad. But after you brown the meat and sauté the aromatics, the stew pretty much takes care of itself as it simmers slowly over the cooktop for a couple of hours. The liquid will still be a bit soupy at the end, so make sure to reduce it down and thicken before adding the meat back to the pot to warm through. Garnish with chopped parsley for a pop of color. For more than a century in Northern Nevada and other parts of the Western United States, Basque immigrants were closely tied to the sheep business. The first Basque sheepmen in Northern Nevada came for the gold rush in the mid-1800s, usually by way of South America. Some Basques who were experienced with livestock found that they could make a better living providing the mining camps with meat and wool than they could by mining. As their operations grew, they began hiring herders from the Basque Country, and Basque sheepherders gained a reputation for dependability. Population pressures and the political and economic environment in the Basque Country made sheepherding an attractive option for young, single men with a sense of adventure. Some of them were not fully informed about the solitary and difficult conditions that awaited them in the mountains and deserts of the West, and most of them did not stay with the job more than a few years. Most of them returned to their homeland located in the western Pyrenees, straddling the border between France and Spain on the coast of the Bay of Biscay. Some Basque sheepherders took their wages in sheep instead of cash, and built their own sheep empires. Others found success in other occupations. In 1966 1,200 Basque sheepherders were employed in the United States, but 10 years later there were 106. It no longer made economic sense to go to America to herd sheep. Basque immigrant communities strive to keep their cultural traditions alive, and Basques in Northern Nevada celebrate their sheepherding heritage. Flavor Step – Mix the rub ingredients in a small bowl. Put the meat in a zipper-lock bag or a bowl, add the rub, and toss to coat thoroughly. Marinate the meat for up to 2 hours at room temperature or overnight, covered if necessary, in the refrigerator. If the meat has been refrigerated, bring it to room temperature before cooking. In a blender or food processor, blend the red pepper and vinegar to a puree. Set aside. 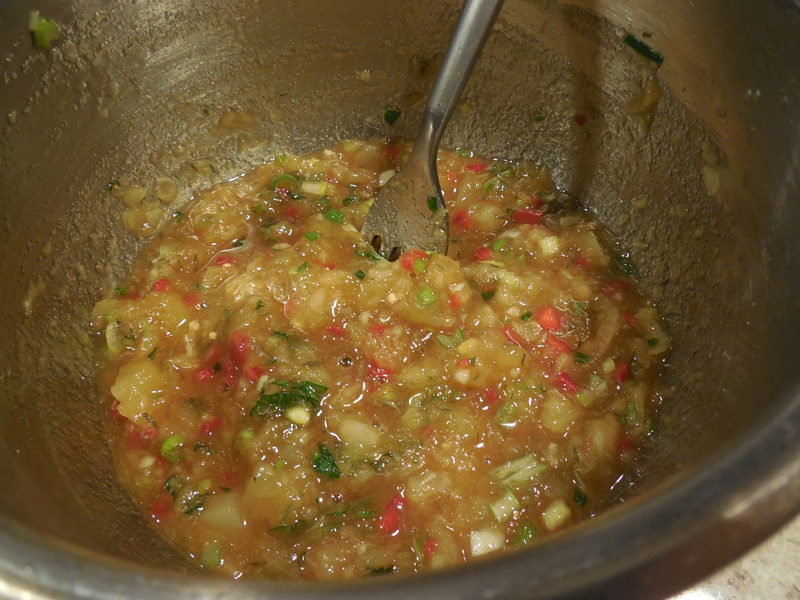 Reduce the heat to medium and sauté the onion, garlic, and green chile, stirring often, for about 5 minutes. Add the lamb, the pureed red peppers, the bay leaves, wine, and stock, reduce the heat to a simmer, and cook, uncovered, for about 1-1/2 hours, or until the meat is tender. Stir once in a while and add more wine or stock if necessary; the liquid should barely cover the meat. Remove the meat with a slotted spoon and set aside. Degrease the sauce and reduce it over high heat to thicken slightly. Remove and discard the bay leaves. Taste for salt and pepper. Return the meat to the pan to warm through, and serve. Spring was finally in full force and the temps were getting warmer by the week, which usually signifies an end to our braising season. But a Sunday in late April was forecast to be cool, wet and windy, which got us thinking that maybe one last hoorah in the braised dish category was in order. However by the time the weekend rolled around, Saturday was the bogus day and Sunday dawned bright and sunny. Mother Nature loves to throw a curve ball every now and then, but it wasn’t enough to make us change our minds about that braised chicken. And we all know, a good cook needs an assortment of chicken dishes to fall back on. Aside from roasting or frying (in addition to grilling which will happen very soon), braising chicken is a simple technique to master. It is said, chicken thighs make the best braises; and you want to use skin-on bone-in thighs for the best flavor. Though it could be done on the stovetop, this Braised Chicken with Lemon and Olives dish is oven-braised. The essence is a Mediterranean/Italian hybrid that I was literally swooning over as I savored every succulent mouthful. It’s so simple to make and exudes so much flavor from all of the fabulous ingredients, you’ll want to make it again and again. Because I prefer white meat, I added a couple of bone-in, skin-on breasts along with the thighs. I know, I know, conventional wisdom says the white meat will dry out, but keeping the skin and bones intact provides protection, so I was willing to take the risk. It seems like most everyone is divided over white meat versus dark meat chicken. Between me and hubby there is a clear divide. He likes the dark meat, preferring the leg or thigh and I am solidly in the white meat camp. Although, while I’m still not a fan of poultry legs, I have been warming up to the thighs. And truth be told, I almost never eat the skin, but I do understand that it’s essential during the cooking process to keep it intact for the white meat to remain juicy. While I was prepping all of the ingredients, Russ came in from doing an errand and alarmingly said, “It supposed to be thighs, not a whole chicken! Did you buy the wrong thing? ?” The truth of it was, I was thinking ahead to another dish earmarked for later in the week that called for a whole chicken. Just pulled out the wrong bird is all, but not before taking the “group” photo of ingredients. Crisis averted. To round out the dinner, we served our chicken with some garlicky mashed potatoes and fresh peas drizzled with a Tuscan herbed olive oil. At first, it may seem like the French and the Irish have little in common, but the two peoples have been allies for centuries. So it’s no wonder they share the passion for food and drink, and no wonder their cuisines pair splendidly. This recipe is a celebration of Franco-Irish relations: Daniel Boulud’s Corned Beef and Cabbage. Our most recent culinary acquisition was Mr. Boulud’s “Braise” cookbook and this was the first recipe we tried. The timing couldn’t have been more perfect as it was St. Patty’s day weekend—when corned beef and cabbage reign supreme. It cooks for several hours so it’s not quick weeknight fodder, but you’ll be hoping there are leftovers. And alas, after trying to locate pink peppercorns at three different stores, we came away empty handed. We’ll order some online for future use, but in the meantime we used mixed peppercorns which appeared to have some pink ones in it, above. As lucky charms would have it, we had a hunk of fresh horseradish in the vegetable bin for the cream sauce, although I think it may lost some of it’s oomph because we felt we needed to add some prepared horseradish to give it the kick we wanted. 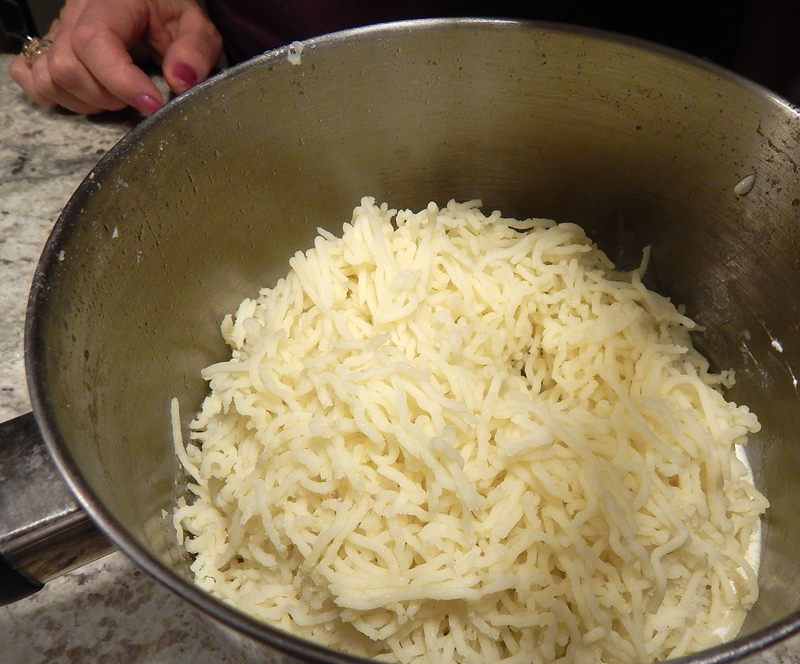 The top photo shows the ingredients before the horseradish cream sauce is mixed together, bottom. Russ planned on making homemade chicken stock the same afternoon for some upcoming meals, and when he realized we needed beef broth for the corned beef recipe, he picked up some leg and neck bones and whipped together that broth too—easy to do with a pressure cooker—and what a difference it makes compared to bland boxed or canned. It’s a double strength recipe that you dilute by half when measuring so it goes a long way and is worth the effort. These three pics show some of the ingredients to make homemade meat broth, although it’s not necessary to make it for this recipe. Once we had all of the cut veggies, cabbage-wrapped meat and broth all in the pot, there was nary an inch of room left. Russ actually added a sheet of parchment then put a large cast iron skillet on top of the lid to make a tight seal. After one hour we took it out of the oven to baste it, and it hardly seemed like it cooked at all, although things were hot. After 3 hours I removed most of the liquid from the pot into a smaller pan, covered the meat pot back up and returned it to the oven while I reduced the sauce. Even after reducing by over half at a vigorous boil for 25 minutes, the sauce remains thin, but it is much more intensely flavored. Russ starts separating the cabbage leaves from the head. 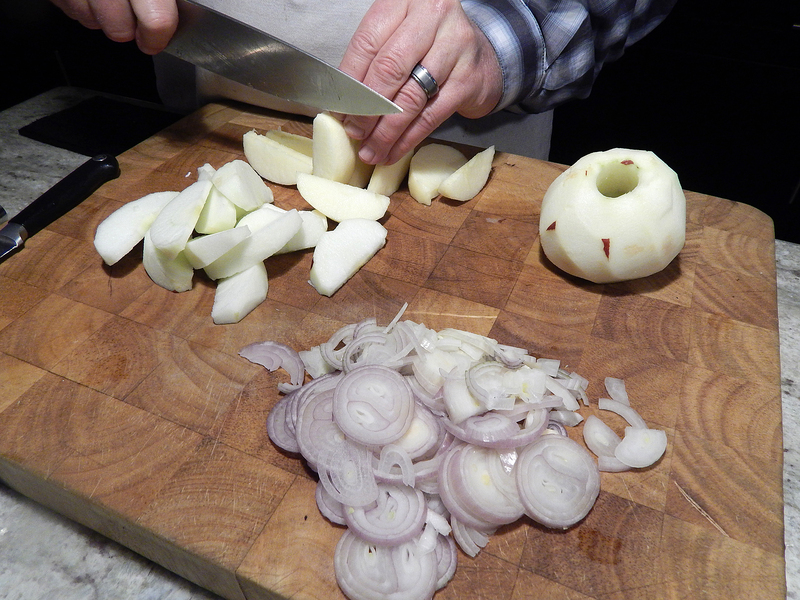 Once he got to the inner leaves, Russ just cut them down into wedges to place around the meat with the other veggies. The individual cabbage leaves are added to boiling water for 4 minutes. After boiling, the leaves are added to an ice bath. Put the corned beef in the center of the leaves, then top with the remaining half. Wrap the cabbage leaves around the corned beef and tie securely with kitchen string, or do the alternative method in Step 4. Bring a large pot of water to a boil, and fill a large bowl halfway with ice cubes and cold water. Add the cabbage leaves to the boiling water and blanch just until the leaves are tender, 3 to 5 minutes. Using strainer, transfer the cabbage leaves to the ice water bath and let cool completely. Drain the cabbage leaves and pat them dry with a paper towel. Using half of the cabbage leaves, make a circle of overlapping leaves one-third larger in diameter than the corned beef. Put the corned beef in the center of the leaves and cover it with the remaining cabbage leaves. Wrap the cabbage leaves around the corned beef and tie securely with kitchen string. Put the potatoes, rutabaga, carrot, turnip, onion, parsnip, bay leaves, and thyme on the bottom of a medium cast-iron pot or Dutch oven. Place the wrapped corned beef on top of the vegetables. (Alternatively, make a circle of overlapping leaves one-third larger in diameter than the corned beef on the bottom of the pot, put the corned beef in the center of the leaves, cover with the remaining cabbage leaves, and scatter the vegetables and herbs around). Add the spice sachet and pour the stock into the pot. Cover the pot and transfer it to the oven. Braise, basting the corned beef every 45 minutes, until the beef is very tender, about 3 hours. If the sauce is too thin or is not flavored intensely enough, ladle most of it off into another pot and simmer it until it thickens and intensifies. Then add it back to the first pot. To serve: mix together the sour cream, horseradish, mustard, and paprika. Remove the string from the corned beef and discard. Cut the corned beef into slices. Serve the beef and vegetables with the seasoned sour-cream on the side. The braising pot is completely full before we put parchment and a lid on it. We only basted twice during the 3 1/2 hours of cooking. Once the meat packet is removed from the pot, cut away the strings. Russ sliced the moist meat right through the cabbage covering. The sliced meat and veggies are arranged on a platter before bringing to the table. Originally from Lyon France, Chef Daniel Boulud is widely celebrated as one of America’s leading culinary authorities. Since arriving in New York City in 1982, he has continually evolved his cuisine and expanded his reach to properties across the U.S., as well as London, Toronto, Montreal and Singapore. *PINK PEPPERCORNS: Peppercorns come in different colors and tastes. Pink peppercorns are not true peppercorns, but are the ripe berries of the Brazilian pepper tree. They are used as a spice and have a lighter pepper-like taste, with a pungent, piney, sweet flavor. Lynne Curry from Fine Cooking dishes on the benefits of Backward Braising. Try her wonderful aromatic Braised Pork Shoulder with Fennel, Garlic, and Herbs, it is delicious! Braised meat is a beautiful thing. Thanks to low, slow cooking in a flavorful liquid, the meat becomes crazy tender and full of flavor. It’s the perfect choice for winter dining, when you’re hankering for a hearty meal and having the oven on for a few hours is most welcome. A braise is practically foolproof and only better if made ahead, so it’s great for both casual family meals and stress-free entertaining. This method is supposed to be even easier, although we both thought it took the same amount of time and work, if not a bit more. When braising, you typically sear meat to brown it for flavor and color, then add liquid and aromatics before cooking it until tender. With this “backward” method, you braise the meat to tenderness first, then brown it in a hot oven. The end result is more of the meat surface is browned, which we consider a plus. There are several rewards for doing this. You skip the messy step of searing the meat on the stovetop and have no chance of burned fat leaving an off taste. You also create a flavorful broth in the pot, which means you don’t need to have stock on hand to braise. The meat from this recipe can be served for dinner as is, in chunks or slices along with its sauce and, say, some potatoes. But you can also shred the meat to use in tacos, as a filling for ravioli, or as a topping for risotto, polenta, or pasta along with some of the sauce. Fennel seed is coarsely ground in a mortar and pestle. Combine the garlic, zest, rosemary, salt, sage, fennel seeds, and pepper in a small bowl. Using a paring knife, trace the fat seams of the roast and around the bone to make a series of deep incisions on both sides, without completely separating the muscles. Coat the meat all over with the rub, massaging it between the muscles and on all sides of the roast. 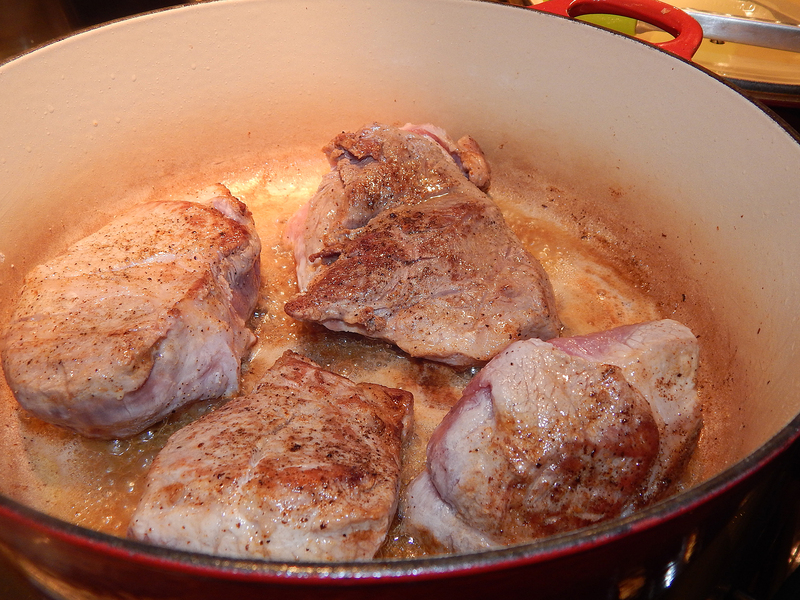 Put the pork in a Dutch oven or high-sided skillet that fits it snugly. Cover and refrigerate for at least 12 hours and up to 3 days. In order for room to add wine, and the chopped onion and fennel, we transferred the roast to a larger braising pot. Using a paring knife, trace the fat seams of the roast and around the bone to make a series of deep incisions on both sides, without completely separating the muscles. Score any external fat or skin and fat with a series of incisions 1 inch apart. Coat the meat all over with the rub, massaging it between the muscles and on all sides of the roast. Since our roast was nearly 4 1/2 pounds, we roasted it for 3 1/2 hours. 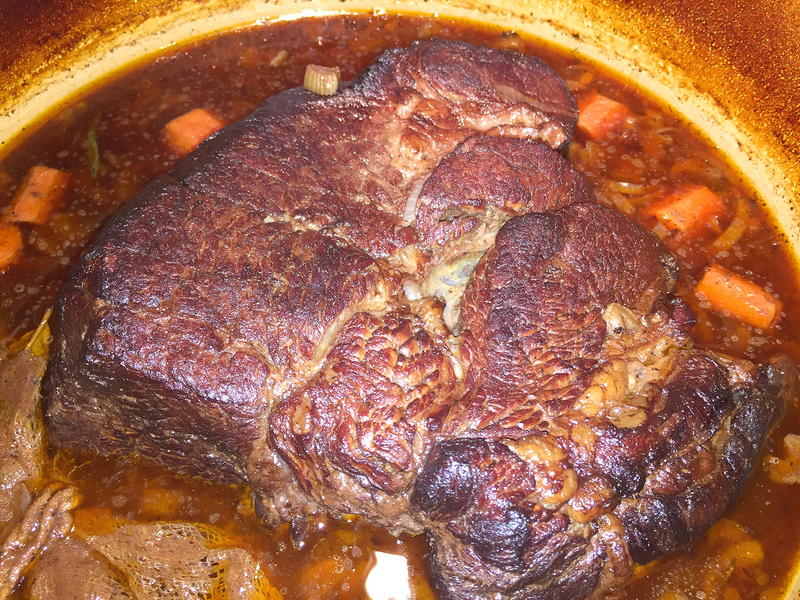 After the roast has cooled slightly, the meat is pulled off of the bone in large chunks. The shredded meat is put back into the pot in one layer over the veggies. Brown one side in high heat for 20 minutes, then turn and brown the other side for another 20. 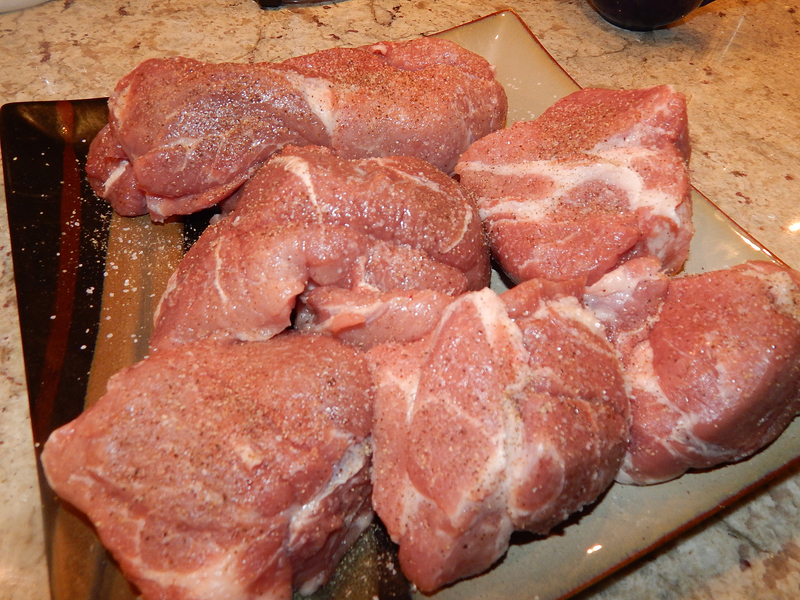 Remove the pork from the refrigerator and let it sit at room temperature for 1 to 1-1/2 hours before cooking. Position a rack in the center of the oven and heat to 300°F. Uncover the pork, and add the onion, fennel bulb and fronds, rosemary, bay leaf, and wine. Cover tightly and cook until the meat is fork-tender, 2-1/2 to 3 hours. Leaving the liquid and vegetables in the pot, transfer the meat to a rimmed baking sheet to cool slightly. Separate the meat into large chunks, and remove and discard all the fat. Raise the oven temperature to 425°F. Cook the pork, uncovered, flipping once, until the exposed surface is well browned, about 40 minutes. Serve with the vegetables and sauce, garnished with fennel fronds, if you like. We served ours with roasted fingerling potatoes and Brussels sprouts. FYI, while braising is similar to stewing, the two cooking methods do have some slight differences. BOTH are moist heat, slow cooking methods that tenderize the beef and develop rich beef flavor. BOTH start with less-tender beef cuts as this cooking method softens the strong muscle fibers and connective tissue, guaranteeing tender, moist, flavorful results. Braising cooks large cuts of beef in enough liquid to partially cover the meat . 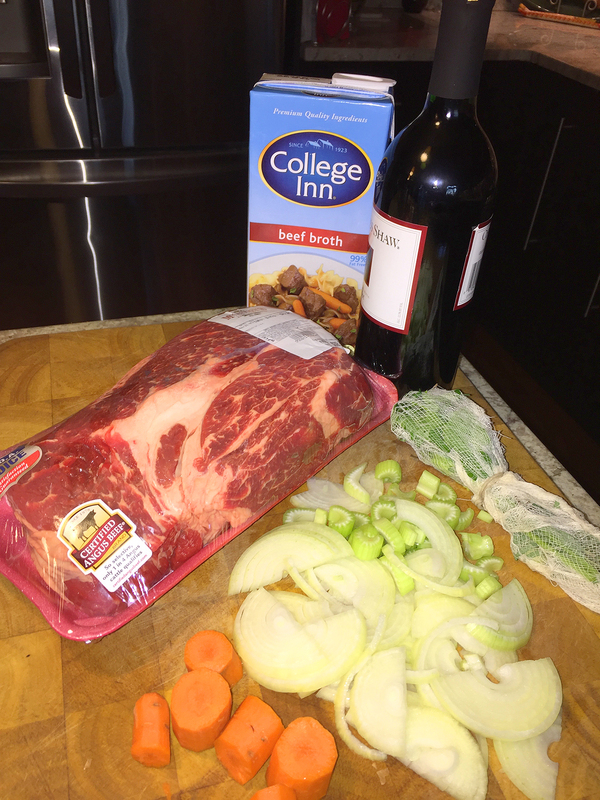 Stewing uses small, uniform pieces of beef pot roast or beef for stew meat that are totally immersed in liquid. Fast forward many decades and it’s not uncommon while we’re dining out for Russ to select duck as an entree, but for some reason, not so much me. I think the last time I ordered it was for my birthday a few years ago at Agricola in Princeton—and that dinner was divine! Duck Two Ways entree at Agricola. Don’t fear the duck. Forget all those stereotypes about stringy, greasy and gamy birds. Chefs and foodies say duck doesn’t deserve its bad reputation, you just need to know how to prepare it properly. Respect the duck. In other words, don’t cook it like chicken. That’s a typical mistake for newbies, and one that prompts kitchen disasters. On the other hand, this recipe is simple enough even for the fledgling chef. Intent on cooking the whole bird, Food & Wine showcased Braised Duck with Pinot Noir, Cherry Tomatoes and Grapes—sort of a cousin to coq au vin—which seemed like a winning combination. In the end, the cooked duck is split and broiled after braising to crisp the skin. My mom’s roasted ducks were always pierced periodically throughout the cooking process to render the fat slowly. This recipe does not call for that procedure so I was somewhat skeptical, but figured if it was rated 5-star in Food & Wine, who was I to second-guess? BTW, there is no white meat on a duck, even the breast is dark meat. Now what to serve with it? Ever heard of Colcannon? Me neither. Colcannon traditionally combines mashed potato and cabbage, but there are as many versions as there are cooks in Ireland. This one uses softened and crunchy cabbage, as well as garlic and leeks for extra depth. (Great idea for St. Patty’s Day!) Our veggie side was Bourbon-Glazed Carrots, which added a nice pop of color as well as a sweet-savory note. Russ salts the bird inside and out. After resting for 30 minutes, the salted bird is added, breast side down, to the cast iron pot with a bottle of pinot noir, peppercorns, bay leaf and garlic. After 20 minutes the duck is ready to turn onto its back. With breast side up, it is now ready for another 20 minutes in the oven. Tomatoes and black grapes are added for the last 45 minutes at a lower 300 degree heat. Russ cuts the duck in half to prepare it for the broiler. The duck emerges golden brown from several minutes under the broiler. Transfer the duck to a rimmed baking sheet. Strain the pan juices into a saucepan; reserve the tomatoes and grapes and discard the remaining solids. Skim off the fat and boil the juices until reduced to 1 cup, 20 minutes. (It was more like 40 minutes for us to reduce to 1 cup.) Add the cherry tomatoes and grapes; season with salt and pepper. After the solids are removed from the liquid, it is added to a fat separator. The liquid simmers for 20-40 minutes to reduce down to one cup. The cooked tomatoes and grapes are added back to the reduced sauce. The unbelievably tasty sauce is plated in a bowl for serving at the table. A braised dish won’t render the skin crispy, so that’s why you need to put it under the broiler at the end. But while it will brown and crisp the skin, it won’t be “crispy.” More than likely you’ll want to remove the fatty skin from the succulent breast meat. You might want to brush up on how to actually carve a duck before you attempt it. Their anatomy is very different from a chicken, as Russ can attest! The complete meal of braised duck, colcannon and bourbon-glazed carrots. Start sautéeing the sliced leeks while the potatoes finish cooking. Once the potatoes are cool enough to handle, peel them. Before adding the milk and cream, make sure the leeks and garlic are starting to brown. Bring the milk and leek mixture to a simmer before adding the potatoes. Start mashing the potatoes with a masher. The longer you do it, the creamier they’ll be. Top the colcannon with butter and sliced scallions. Meanwhile, melt 4 Tbsp. butter in a large saucepan over medium heat. Add leeks and cook, stirring frequently, until very soft, 8–10 minutes. Add garlic and cook, stirring frequently, until garlic is fragrant and leeks are just beginning to brown around the edges, about 3 minutes longer. Add 1 cup cabbage and cook, stirring constantly, until wilted. Add milk and cream and bring to a simmer. Growing up I HATED pot roast. But to be fair, I pretty much hated anything that wasn’t a dessert or a snack until my mid-teens when I forced myself to start liking vegetables. Hard to believe I was that picky. Fast-forward several decades, and now it’s VERY rare if I ever eat dessert, go figure… but back to that pot roast… Transform the low-status meal into a guest-worthy feast… REALLY! Bouef a la mode, is another fabulous braised dish by Dorie Greenspan from Around My French Table. What makes this dish “a la mode” and not a stew is the fact that the beef is cooked in a hunk, not in chunks. This roast is marinated overnight and, in the process, tenderized, then browned well and simmered gently in the oven in a combination of herbs and vegetables, wine and Cognac, and a surprise ingredient: anchovies. To complete the meal, we paired it with her equally tasty Spiced Butter-Glazed Carrots and a side of garlic mashed potatoes. Fair warning, you will need time on your hands for this beauty because of the overnight soak. And, like so many slow-cooked dishes, after hours in the oven, the beef is tender and the sauce is richly flavored and just as richly colored. It makes for fabulous leftovers, so unless you’re feeding a multitude, you’ll get at least two meals from all of your effort. Now I can honestly say after feasting on this dinner, I LOVE pot roast! The ingredients for the marinade. The chuck roast getting happy in the overnight marinade. Searing the roast on all sides and edges. The next day, remove the beef from the marinade and, if you’ve got the time, let it come to room temperature. Meanwhile, strain the marinade, reserving the vegetables and bouquet garni, and pour the liquid into a medium saucepan. Bring to a boil over high heat and cook until reduced by half, about 10 minutes. Add the beef broth and bring back to a boil, then remove the pan from the heat. Center a rack in the oven and preheat the oven to 350 degrees F. Have a heavy 4- to 5-quart Dutch oven or casserole with a cover at the ready. Using paper towels, pat the beef dry as best you can. Put a heavy skillet* over medium-high heat and pour in 2 tablespoons of the grapeseed, canola, or peanut oil. When it’s hot, put the roast in the pan and sear it on all sides, making sure you get good color and a little crust on it. Transfer the roast to the Dutch oven and season it with salt and pepper; discard the oil. *NOTE: Next time we’ll just use the dutch oven for all steps. It seemed a waste to use an extra skillet. Return the skillet* to medium heat, pour in the last tablespoon of oil, and toss in the drained vegetables. Cook, stirring, until the vegetables are softened, about 10 minutes. (Because the vegetables won’t be perfectly dry, you might not be able to brown them, but pan-cooking will give them a roasted flavor.) Season with salt and pepper, pour in the Cognac, and stir and scrape to loosen any bits that may have stuck to the bottom of the pan. Transfer everything to the Dutch oven. Once again, put the skillet* over medium heat. Pour in about ½ cup of the wine-broth mixture and stir in the anchovies and tomato paste. Cook, stirring, until the anchovies “melt,” a matter of minutes. Pour in the rest of the wine-broth mixture and stir to blend, then toss in the reserved bouquet garni, season with salt and pepper, and transfer to the Dutch oven. Put the Dutch oven over medium-high heat, and when the liquid comes to a boil, cover the pot tightly with a piece of aluminum foil and the lid. Slide the beef into the oven and allow it to braise undisturbed for 1 hour. Pull the pot out of the oven, remove the lid and foil, and turn the meat over. (This step really isn’t necessary, so if you’re not around to do it, don’t worry about it.) Re-cover the pot with the foil and lid, slip it back into the oven, and cook for another 1½ to 2 hours (total time is 2½ to 3 hours), or until the meat is fork-tender. Taste the sauce, and if you’d like it a little more concentrated (which we do, so we reduced it further), pour it into a saucepan, put it over high heat, and boil the sauce down until it’s just the way you like it. (If you’re going to reduce the sauce, don’t salt it until it’s reduced.) Using a large serving spoon, skim off the surface fat and taste for salt and pepper. You can serve the roast now or cool it (if you cool it, leave the fat and skim it off when it’s cold— it’s much easier to do it then) and serve it later (see Storing). Slice the beef and, if necessary, rewarm it in the sauce. Cooking the drained vegetables until softened. Adding the wine/beef broth and softened vegetables to the roast in the dutch oven. The meat when fully-cooked is fork tender! 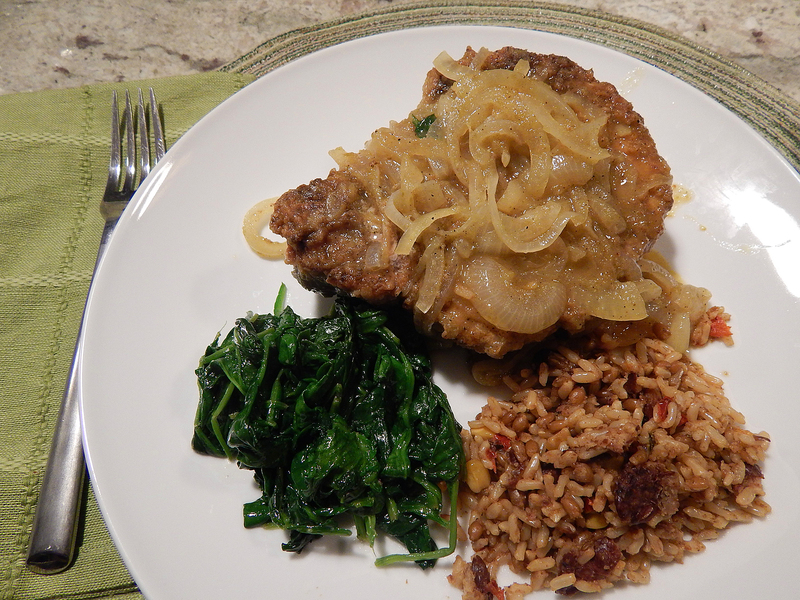 Like most braises, this one is good (actually even better) a day or two later. Keep the boeuf à la mode well covered in the refrigerator and, before serving, spoon off the fat and heat the sauce through (with the vegetables, if you haven’t discarded them) either on the stovetop or in the oven. You can also pack the dish airtight and freeze it for up to 2 months. 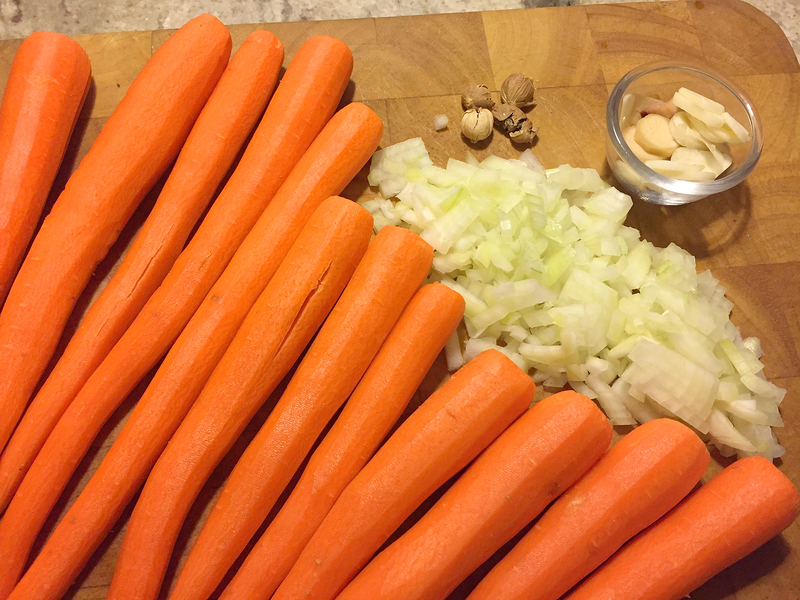 The ingredients prepped for the carrot side dish. Sautéing the chopped onion, ginger, garlic and cardamom seeds. Now uncovered, evaporating the remaining liquid. Perfectly cooked and ready to eat. Over medium heat, melt the butter in a medium-sized saucepan. Stir in the chopped onion, ginger, garlic and cardamon seeds, season very lightly with salt and white pepper and cook, stirring, until the vegetables soften, about 5 minutes. 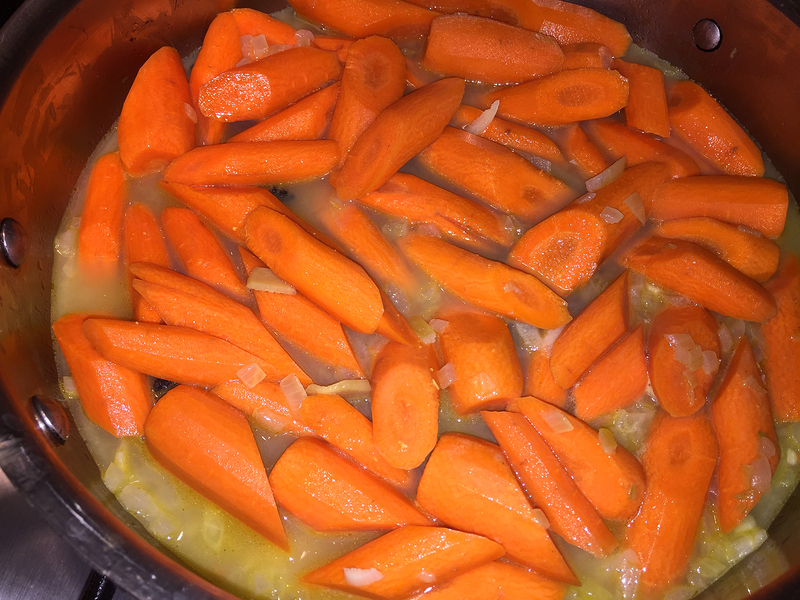 Remove the cover, raise the heat, and cook until the broth almost evaporates completely, leaving the spiced butter glazing on the carrots. Season with salt and pepper and serve. 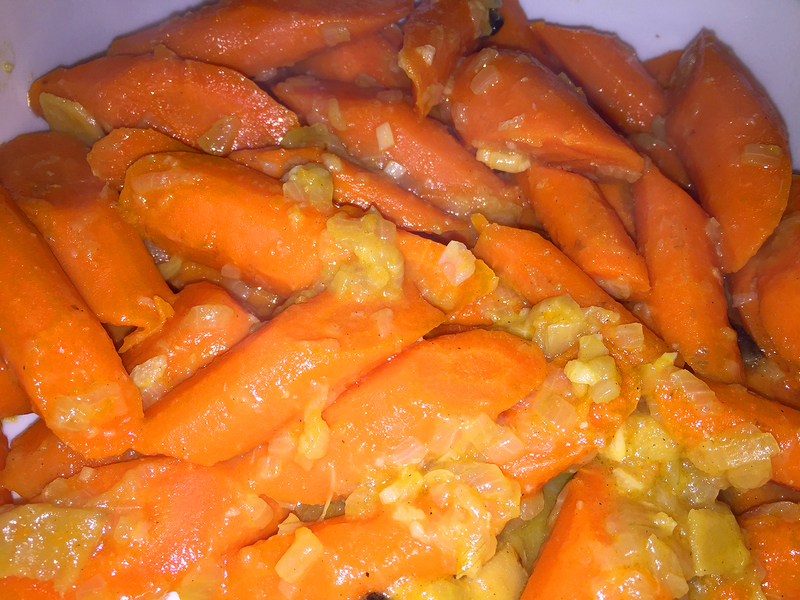 NOTE: Dorie says the carrots are best served soon after they are prepared but can be refrigerated overnight and gently reheated the next day. Pot roast, when made according to a few fundamental rules, can be a totally delicious addition to your culinary repertoire. —by Tony Rosenfeld from Fine Cooking. A double dose of chile—canned and powder—adds pleasant heat to this quick skillet braise of Pork Chops with Green Chilies and Onions. The peppers’ light green hue may fade slightly as they simmer, but their spicy essence intensifies into a delicious sauce. Generally speaking, we like our meat and poultry to be bone-in. There are a couple of reasons: First, it slows down the meat’s cooking, so it gives you a little more leeway to get a good, crispy sear on your chop. Second, the bone gives the meat a richer flavor. So instead of boneless chops we used very thick bone-in meat and therefore had to increase the cooking time about another 4 minutes. Then, for a smoky kick, we substituted chipotle chili powder. Being a weeknight and to expedite the cooking process, our sides were a prepackaged Caribbean rice dish and fresh sautéed spinach, both of which only took minutes. Let your chops sit on the counter for about 30 minutes before you begin to cook them. If the meat is too cold, the outside will overcook while the inside comes to the right temperature. Giving the pork a little time to warm up will ensure a nice crust on the outside, with a tender center. *NOTE: Jarred jalapeños are a staple in our kitchen. They’re simple to make and last for months in the refrigerator. Simply buy 8-10 fresh jalapeños, slice vertically into 1/2″ circles and store in a tight-lidded glass jar with vinegar. Perfect for all of your Mexican dishes and those wonderful nachos during football season. In a small bowl, combine the cumin, chile powder, 1-1/4 tsp. salt and 3/4 tsp. pepper. Sprinkle on both sides of the pork and set aside. In a blender or food processor, purée the chicken broth, green chiles (with their liquid), jalapeños, and vinegar until smooth. Put the flour in a pie plate and dredge the pork chops, shaking to remove any excess. Heat a 12-inch skillet over medium-high heat for 1 minute. Pour in 2 Tbs. of the oil and heat until shimmering hot, about 1 minute. Add the pork chops and cook, without moving, until they’re brown around the edges and release easily from the pan, 2 to 3 minutes. Reduce the heat to medium, flip, and cook the other side until browned, about 2 minutes more. Transfer to a large plate. Over medium-high heat, add the remaining 1 Tbs. oil and the onion to the skillet. Sprinkle with 1/2 tsp. salt and cook, stirring occasionally, until wilted and golden, about 4 minutes. Add the green chile mixture and bring to a boil. 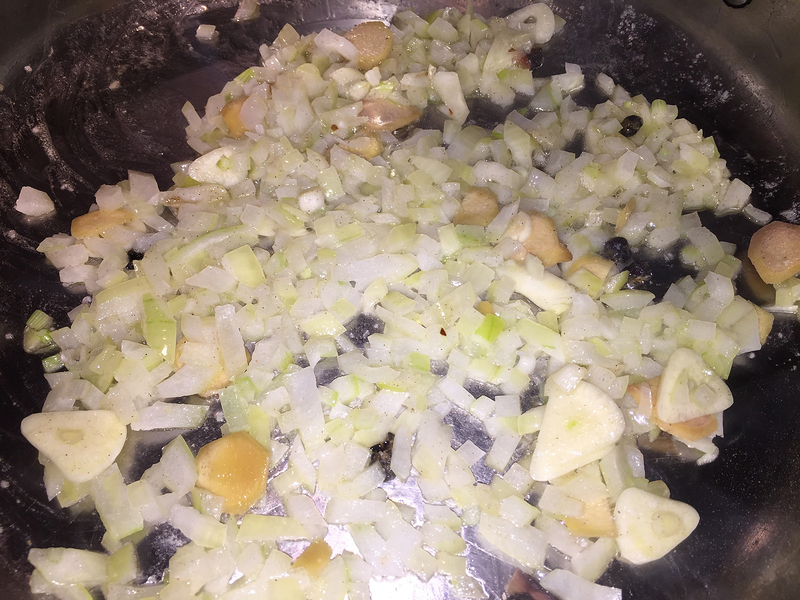 Reduce to a simmer and cook, stirring, until the mixture thickens slightly and the onions are completely tender, 2 to 3 minutes more; add a splash of chicken broth if the mixture seems dry. Season to taste with salt and pepper. Return the chops to the pan, nestling them into the onions. Cover and simmer gently until the pork is fairly firm to the touch with just a little give, 3 to 5 minutes. With a paring knife, make a nick in a thicker chop to make sure it’s only just a little pink. Serve the pork chops topped with the sauce. 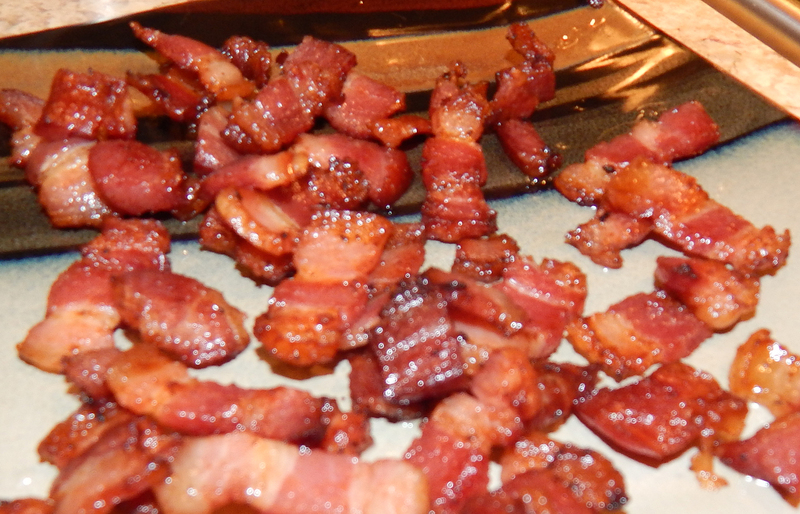 Usually after you get your pork on the cutting board, you shouldn’t touch it for 10 minutes. If you cut into it right away, all its juices will run onto the board instead of getting redistributed into the meat and that delicious liquid runs away! But using this cooking method, it’s more like a braise, and therefore not necessary. Add some color to the plate by serving the chops with Arroz Verde (Green Rice), which gets its hue and flavor from spinach and cilantro. Here’s yet another braised dish winner: Pork Shoulder Braised with Apples, from one of our favorite cookbook authors, Molly Stevens. Russ grew up with the tradition that you always eat pork and sauerkraut on New Year’s Day, a German custom that is believed to bring good luck and good health during the upcoming months — common in the Pennsylvania Dutch region of the United States. Although I confirmed with my mother that she did not serve, nor hear of, such a tradition. Customarily Russ cooks his own version, braising the pork shoulder in beer and peppercorns right along with the sauerkraut, but I selected Molly’s dish for a change of pace, content with the fact that she has never done us wrong! While it is too time consuming for a weeknight meal (unless you perform the DO AHEAD method), it is perfect for a cool weekend, and grand enough for company. 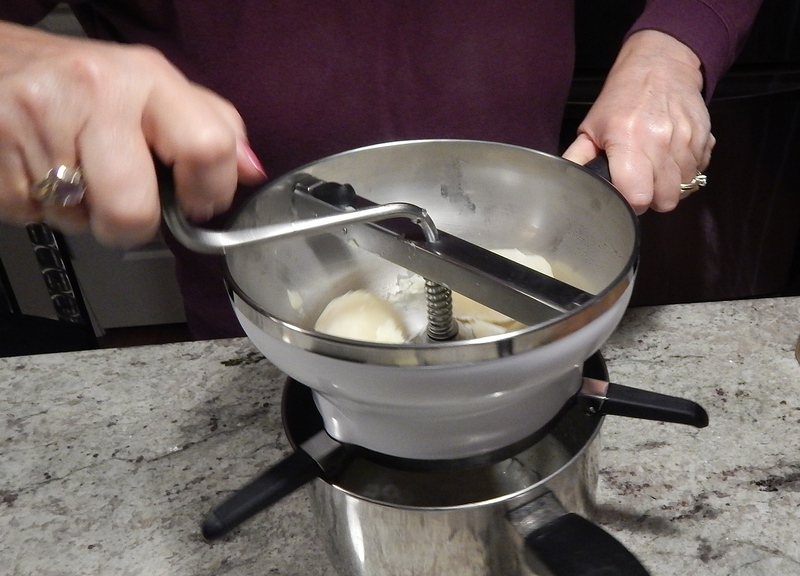 We paired ours with the traditional sauerkraut, and creamy garlic mashed potatoes which we made using our new Christmas toy, a food mill/ricer. And fresh out of chives, we didn’t add the garnish. WOW, it was out-of-this-world good! You know it when you taste it, but just what is it that distinguishes a great dish from an ordinary one? 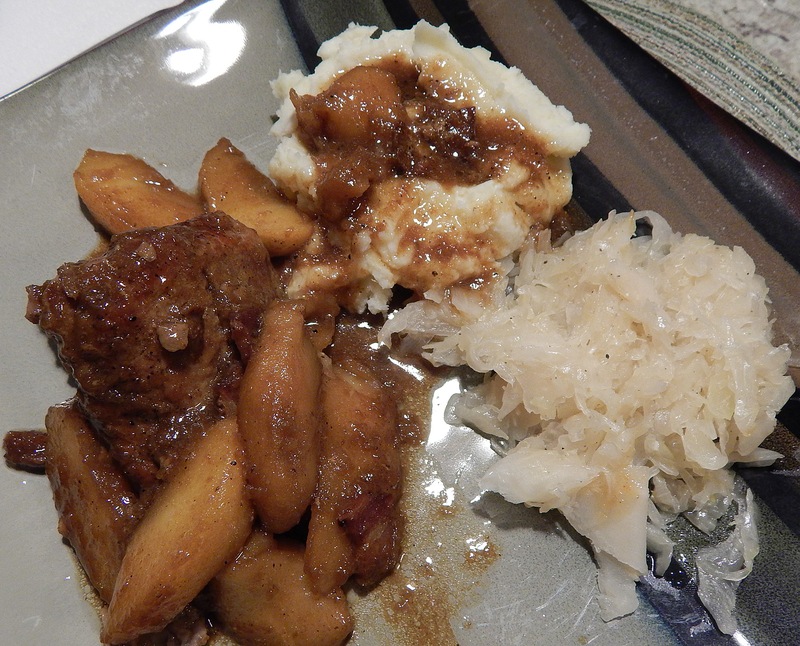 In this case, the succulent apples had incredible layers of flavor, the pork was perfectly moist and tender, and the sensational sauce made a perfect drizzle over the potatoes and kraut. All-in-all, a fabulous dinner taken to another level that just may bring us good luck in 2015. Sauté the onions and garlic until soft, then add the beer and herbs. After a few minutes add sauerkraut and simmer on low for a 1/2 hour. Remove thyme and bay leaf. Salt and pepper to taste. 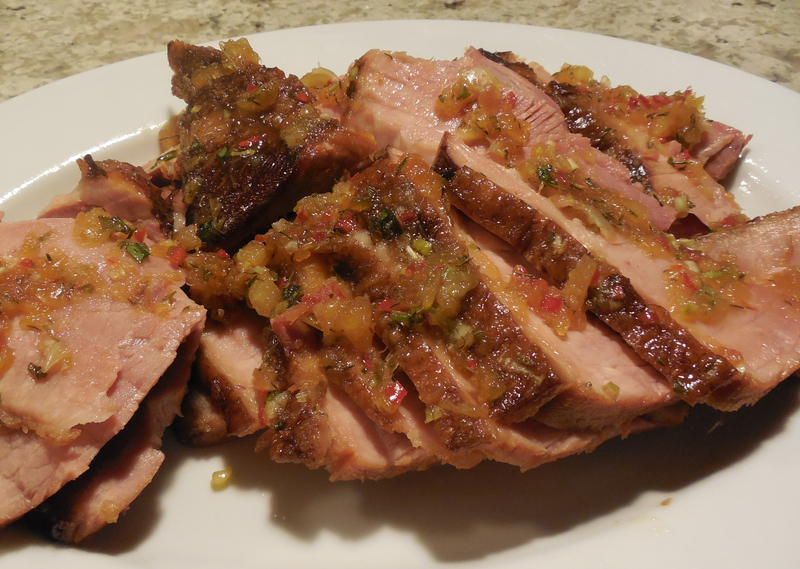 Sliced cider-braised ham with spicy pineapple glaze. We couldn’t remember the last time we had made a ham, which tells you something right there! But an article in the April-May 2014 issue of Fine Cooking piqued our interest. Their favorite two methods are roasting and braising and we opted to go the braising route, and sure glad we did! 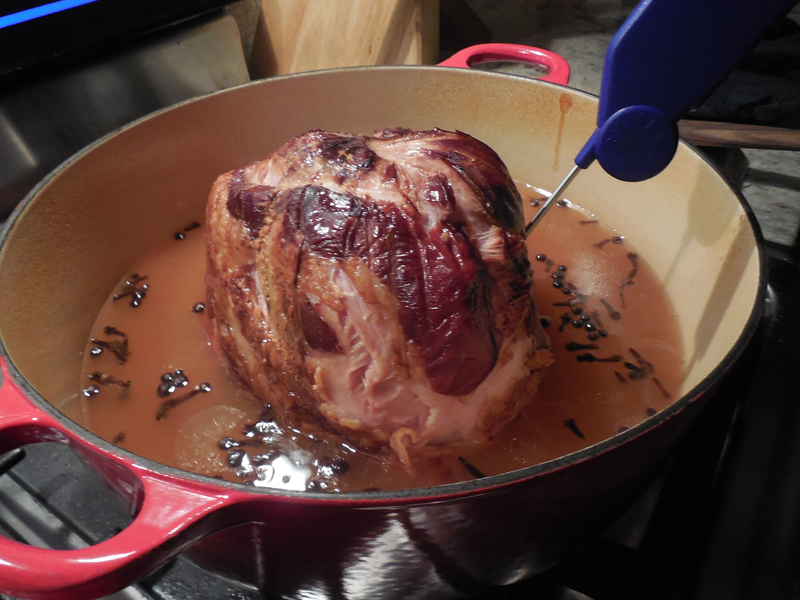 After this meal, we wondered why it had been so long since we cooked a ham. The meat was incredibly flavorful and we vowed to try another soon but with one of the other two glazes: cherry-chutney glaze and ginger lime glaze. 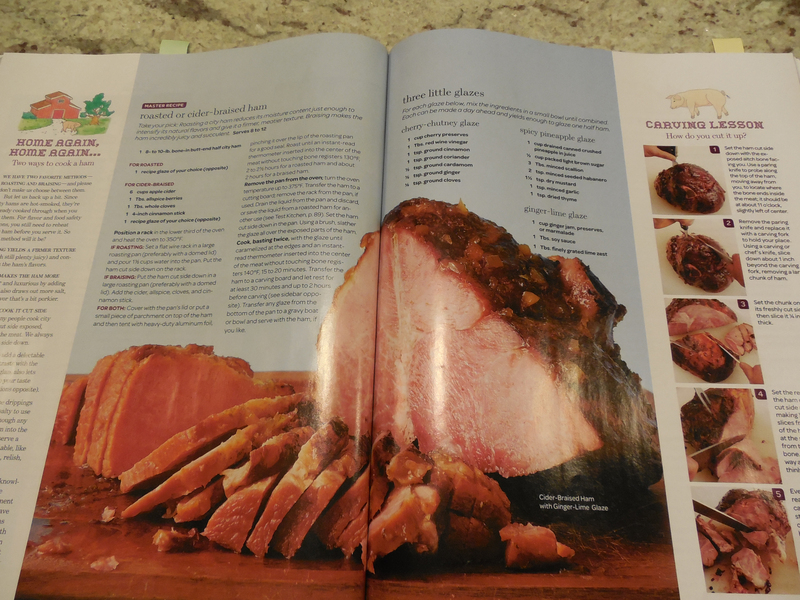 The Fine Cooking magazine spread featuring roasted and braised ham methods. Now this recipe called for a 8-10 pound city ham, which is way too much meat for the two of us, even with leftovers. So we purchased a 5.5 pounder, which still gave us plenty for two more meals, plus a ham bone for homemade soup. As an added bonus, Fine Cooking highlights several “Lucky Leftovers” meals, of which we took full advantage. Russ is testing the meat temperature before the glazing step. Combined ingredients for spicy pineapple glaze. The spices in this glaze are reminiscent of Jamaican jerk seasoning, lending a Caribbean flavor profile to this ham. I can’t think of a better way to cook during the cold fall and winter months than braising. What is that you ask? The art of braising comes down to us from the earliest days of cooking, when ingredients were enclosed in a heavy pot and buried in the hot embers of a dying fire until tender and bathed in a deliciously concentrated sauce. Wikipedia fact: Braising is a combination cooking method using both moist and dry heat; typically the food is first seared at a high temperature and then finished in a covered pot with a variable amount of liquid, resulting in a particular flavor. Our go-to favorite cookbook for this type of cooking method is “All About Braising — The Art of Uncomplicated Cooking” by Molly Stevens. Russ asked for it for Christmas many years ago and we refer to it countless times during the cold months. While we have earmarked many of our favorite dishes, we have NEVER made any recipe from this book that we didn’t adore! In addition, the book contains useful tips, suggestions for sides, and a variety of enlightened wine choices. Seriously, add it to your wish list now. Our most recent braised dish from Molly’s book was Pork Pot Roast with Apricots, Cardamom and Ginger cooked in “Big Red.” Each time we cook one of Molly’s recipes, we swear that meal is our favorite, and this one was no exception, it was to die for! We were intensely impressed with the depth of flavors provided by the sauce ingredients which made the dish so rich and full-bodied. To accompany the braise, we had garlic roasted brussels sprouts with maroon baby carrots (beautiful coloring) and wild rice with mushrooms and leeks. The seared pork roast getting ready to braise in the oven for two hours. We couldn’t locate whole cardamom pods, so we substituted 1 tsp. for the 6 pods. 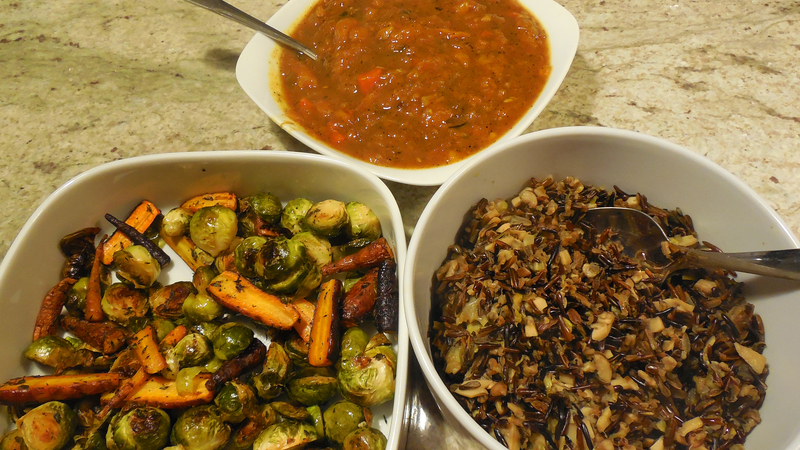 At top is the very flavorful sauce, along with roasted brussells sprouts with baby carrots and a wild rice dish. It’s a well-kept kitchen secret: Braising makes heroes out of weekend cooks. There is no other technique that asks so little yet gives so much back. As long as you can remember four simple, universal steps (and have the patience to wait as the braise fills your house with the most tempting of scents), anyone–anyone–can elicit oohs and aahs from a table full of friends and family. Really, it’s that easy to produce restaurant-quality results from a home oven, whether you’re talking fork-tender short ribs or fall-off-the-bone pork shoulder. Basically any number of cuts of meat that benefit from a seared exterior and a thick, rich, glistening sauce that has been building all day. If you’re looking to dial it up in the kitchen (with minimal effort), braising is a secret you need to be in on. WOODEN TURNER — Its broad, flat end is ideal for scraping up all the flavorful browned bits on the bottom of the pot, and it won’t scratch the enamel surface. DUTCH OVEN — Enameled cast iron heats evenly and retains temperature well. BRAISING LIQUID — Make it count. 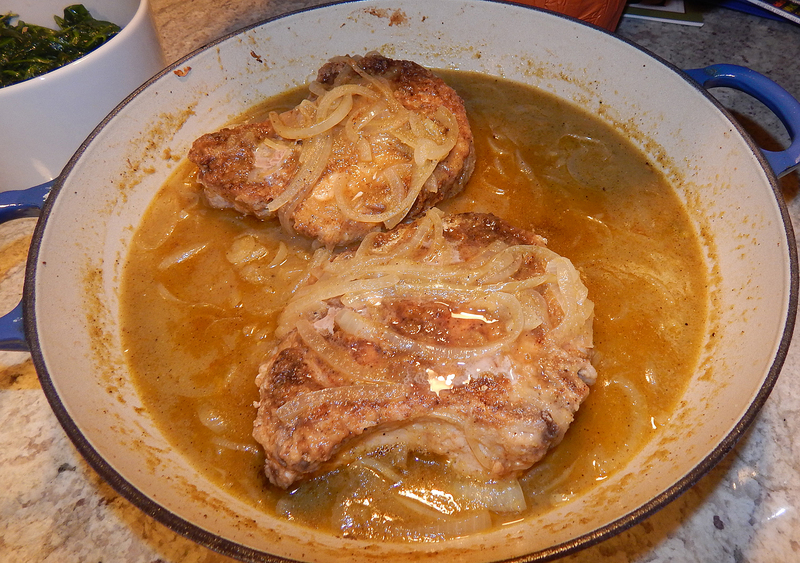 Most braises are done with stock and/or wine. But a splash of this or that brings balance, complexity, and depth to the final product. Broth (or stock) underscores the meatiness of the main ingredient. Match the broth with the protein when you can, but chicken broth is universal. Beer, especially the lighter lagers, contributes a pleasantly sour note that is tailor-made for pork. Darker stouts and porters play well with beef, as do certain Belgian ales. 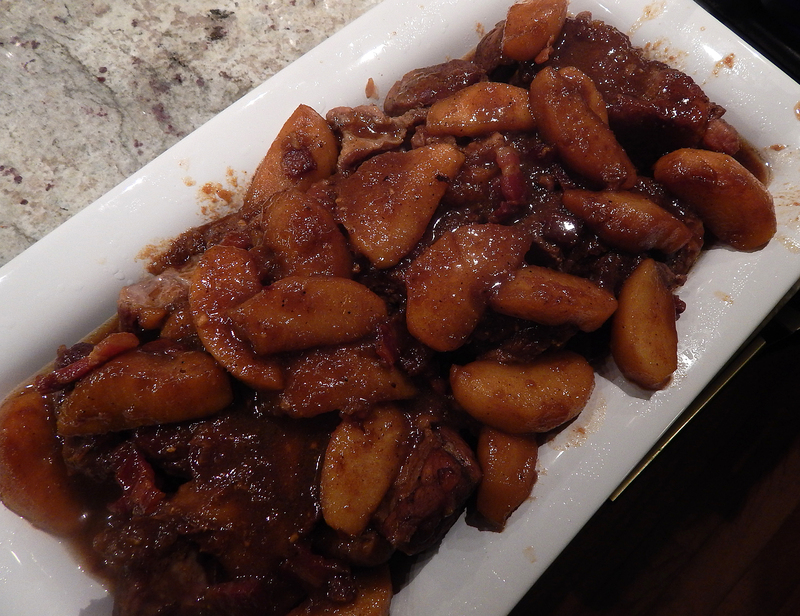 Cider, fresh or fermented–adds sweetness to braised poultry and pork. great in tandem with cider vinegar. Water is often overlooked as a braising liquid, but it works when you want to keep things light or if there are other strong flavors at play. It’s always a better choice than poor-quality broth. Wine adds nuance and a jolt of acidity to any dish. Use it in combination with broth, and, whether red or white, choose something dry. Cook with a bottle you’d actually drink. And of course, enjoy a glass yourself while waiting for the braise to finish! It’s what you do before the braise goes into the oven that counts. There are ways to refine the finished product (think of steps 5 and 6 as extra credit). But as long as you nail these key moments, everything else is just gravy. Season the meat on all sides. Pour oil into a heavy lidded pot (like a Dutch oven; see above) set over medium-high heat, then add the meat. Don’t crowd the pot and take time to get deep color all over. Remove meat; set aside. Cook chopped onions, celery, carrots, etc., in the drippings left behind from searing, stirring frequently. Like the sear, use medium-high heat and aim for a caramely brown color–without scorching your ingredients. Add the braising liquid, stirring and scraping up any browned bits from the bottom of the pot with a wooden turner. These bits are flavor bombs. When they’re dissolved in the cooking liquid they enrich the entire dish. Return the meat to the pot, with any accumulated juices and the broth. 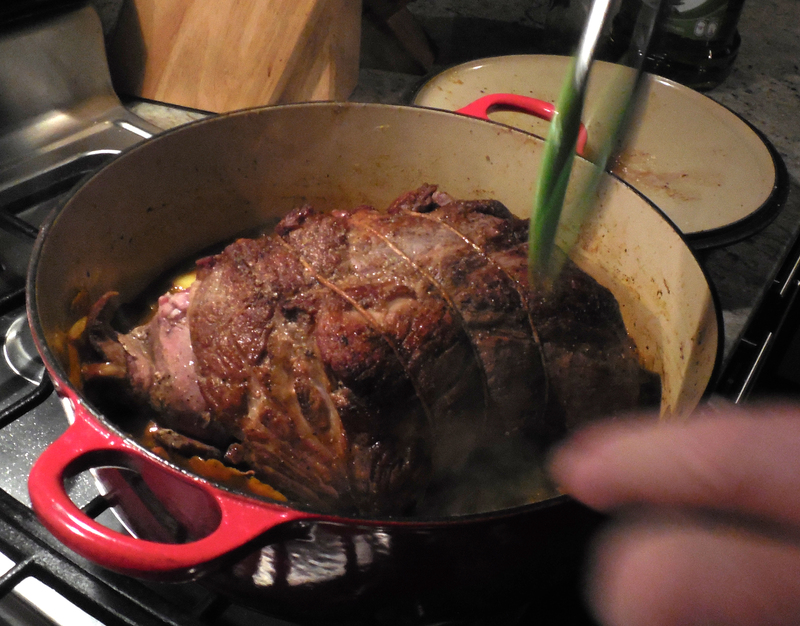 The meat should not be submerged–you’re braising, not boiling, those lamb shanks! (adding too much broth will ultimately dilute the sauce.) Bring the liquid to a simmer, then cover and slide into a 325-degree oven. ADD MORE VEG: If your recipe includes added vegetables (such as fennel, potatoes, or greens), add them to the pot 45 minutes before the meat is done. Check the liquid. If it’s low (say, less than an inch), add a splash more. Return pot to the oven. REDUCE THE SAUCE: When the meat is fork-tender, remove it and any vegetables. Skim surface fat, then simmer until you’ve got a rich sauce that coats the back of a spoon. Return meat (and vegetables, if using) to the pot to heat through. A handful of just-chopped herbs (parsley, mint, cilantro) adds color and freshness. Grated citrus zest and a squeeze of juice injects a bright note. A splash of vinegar balances the richness. A pinch of Maldon sea salt gives any dish a saline crunch. A dollop of creme fraiche or heavy cream will mellow. Spice blends, such as shichimi togarashi or za’atar lend a savory punch.